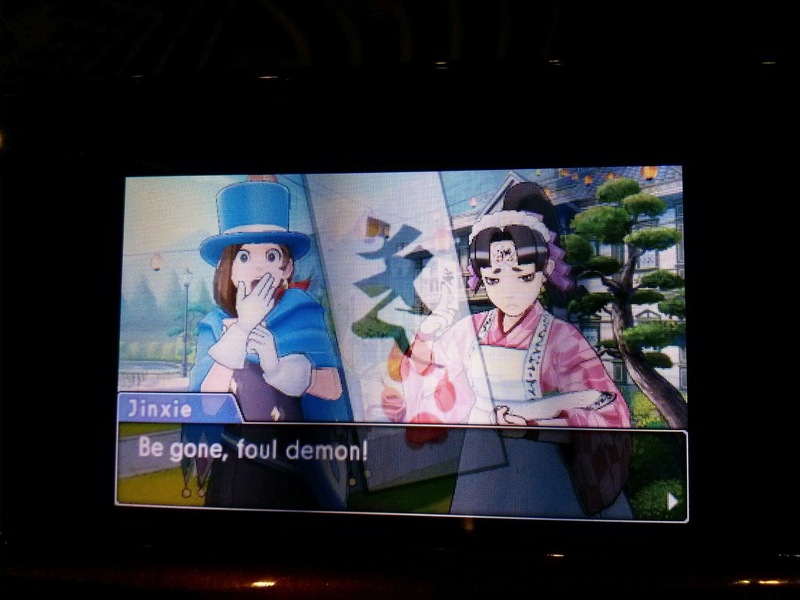 One of the many ways in which Dual Destinies makes good use of 3D effects – with an in-your-face yokai charm. When I looked at the complex relationship between video games and established “arts” like cinema, music, and literature, I argued that the final sequence of Phoenix Wright – Ace Attorney: Justice for All, with its intricate plot lines and dynamic characters, transcended video games and entered into the realm of drama or the novel. Justice for All wasn’t the strongest title in the GBA/DS line of Ace Attorney games; the original and Trials and Tribulations were more consistent and arguably more critical to the series’ overall mythology because they introduced characters such as Miles Edgeworth, the Von Karmas, and Godot. But that infamous Matt Engarde case from Justice for All is without equal among the Ace Attorney games or most games, period. Engarde’s different personae and the high stakes of Maya’s kidnapping made “Farewell, My Turnabout” not just an outstanding piece of art, but the quintessential Ace Attorney case. More than any other, it was a story that you had to experience rather than play through – insofar as you could “win” the game, your progress was only a mechanism for moving the story along, a state of affairs that is the opposite of most games, in which the plot is just window dressing as you go about collecting more kills and corralling more items. That focus on plot was always what made Ace Attorney special and “Farewell, My Turnabout” has it in spades. It was as black as a spade, too. The case’s darkness went above and beyond that of its peers, including the Manfred Von Karma showdown from the original. The player could even suffer a “bad ending” if Engarde weren’t acquitted. It can be easy to overlook the fact that characters are dying and being putted into danger against the backdrop of Ace Attorney’s melodramatic digressions about film, aesthetics, and culture. But what if we finally got an Ace Attorney game that took its latent darkness more seriously, that found a way to? The newest title in the series, and the first for the 3DS, is unmistakably an Ace Attorney game. The same investigation/trial structure from the first four installments shows up here, as do the characeristic shouts of “Objection!” But there’s something fundamentally different about Dual Destinies, and it’s primarily a difference of tone. First, check that ESRB rating. Yep, that’s a big fat “M (17+)” and it’s well-deserved. This game is full of blood, sinister laughs, and foreboding. I mentioned Ninja Gaiden – The Dark Sword of Chaos in my entry about video games and art, and I couldn’t help but think of it again during one of the cutscenes involving new prosecutor-villain Simon Blackquill. The sea of blood that covers the floor after one of Blackquill’s trademark blade slashes is a dead ringer for the bloody action from Dark Sword of Chaos. Like that game did for the NES, Dual Destinies is blazing a new trail and bringing something new to the table for the normally family-friendly 3DS. Blackquill’s status as a felon makes him perhaps the most wicked of Ace Attorney’s antagonists – or does it? Manfred Von Karma and Godot were also killers, although their actions were not known until they were melting down in the face of Phoenix Wright’s torrid strategies. Still, Blackquill’s past is a sign that the game isn’t messing around or confused about its identity – it wears its darkness proudly. The graphics are a big bump up from the GBA/DS games, with beautifully rendered 3D models. This game makes better use of 3D than any 3DS title I’ve played except possibly Super Mario 3D Land. The effect is both subtle and complex. In the courtroom, 3D adds a nice layer of depth to revelatory moments when the camera pans across the crowd. It also makes the witnesses and attorneys really pop out from the screen, giving life to their gesticulations. There’s also a nice effect in one of the gardens, in which the 3D makes the lanterns appear to sway on the line. The game now has a retraceable conversation history, which is helpful if you skip through dialogue with the B button or need to review clues. And new attorney Athena Cyke’s emotional intelligence scanner is intriguing, although not that much different than Apollo’s magical bracelet. Dual Destinies may be the best all around Ace Attorney game. From a technical/graphical standpoint, it’s much richer than its predecessors, and its story lines have a certain darkness that makes the player feel like what he/she is doing is much more important than ever before. It’s only $26 in the eShop, making it significantly cheaper than previous installments. If you have a 3DS, then this game beckons.